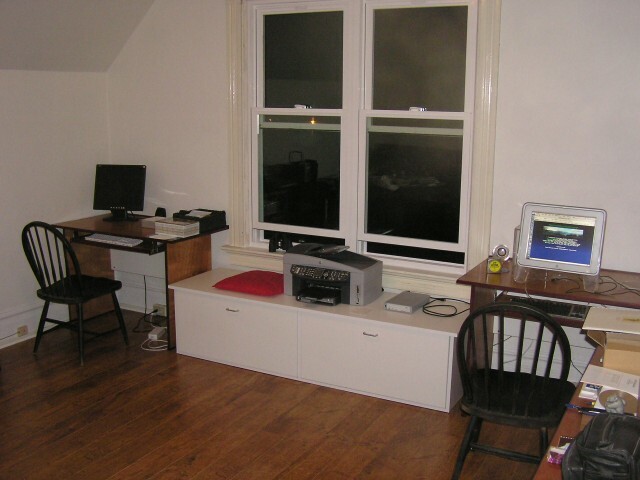 Workroom: On-and-off during the late Spring and Summer of 2005 I built furniture for our upstairs workroom/office. Previously it had contained a pair of black metal desks, a hodge-podge of bookcases and an old fold-out couch. The family heirloom round oak table served as breakfast table and library table. 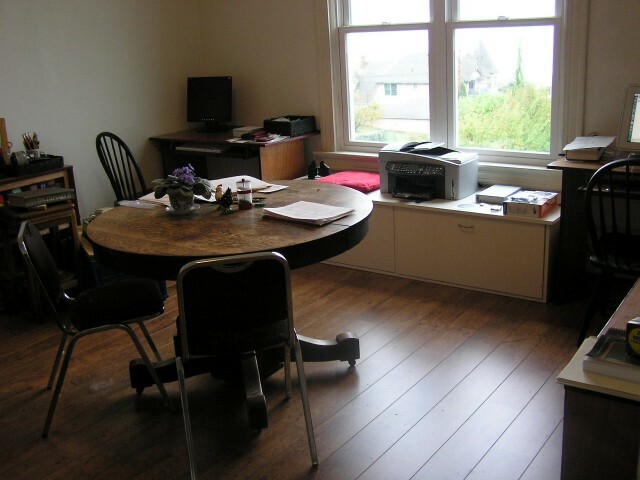 During the summer we replaced the old carpeting with antique oak laminate flooring. When that was done we moved the new furniture in. We moved the desks from along the wall to either side of the window (beautiful view of Bellingham Bay and the San Juan Islands). 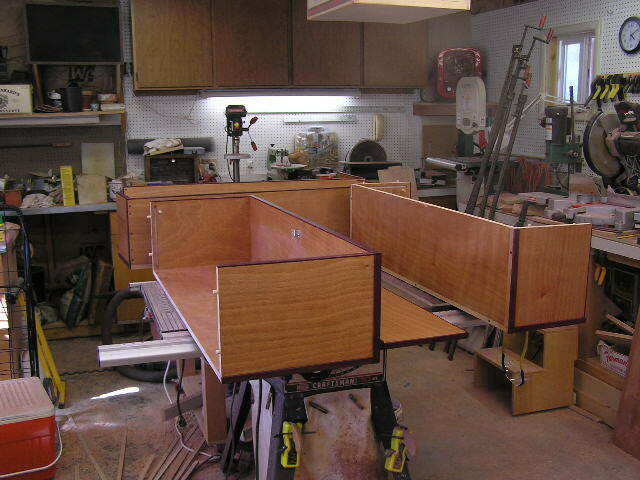 Each desk is mahogany ply trimmed in purpleheart. 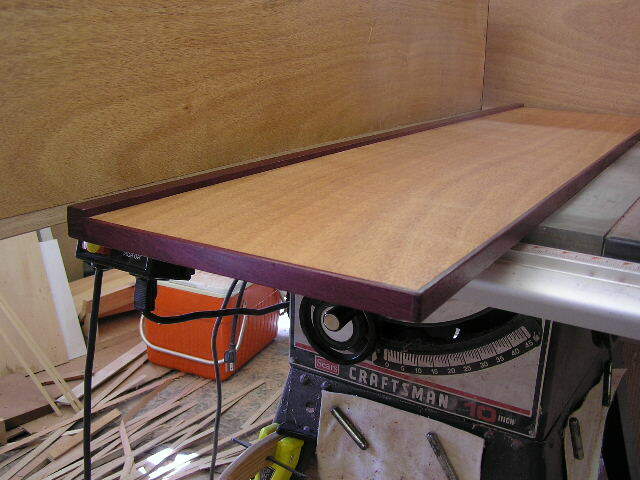 There is a slot along the back to accept wires; these drop behind the melamine stretcher stabilizing the legs. The keyboards are on ball-bearing sliders. 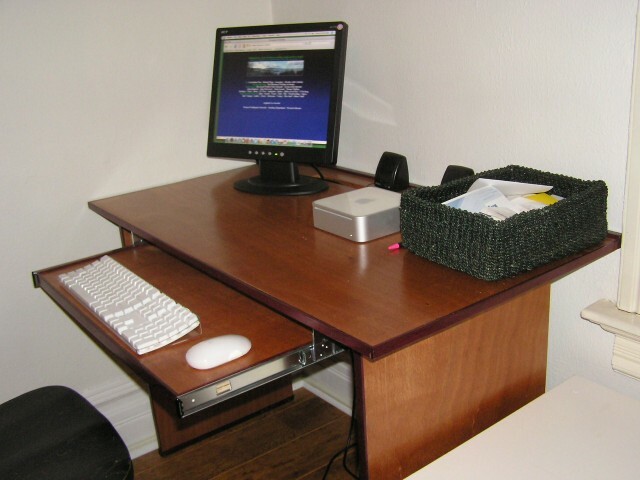 Between the desks I built a melamine cabinet with two large slide-out drawers. One side is files, office supplies, etc. ; the other houses all the wiring. 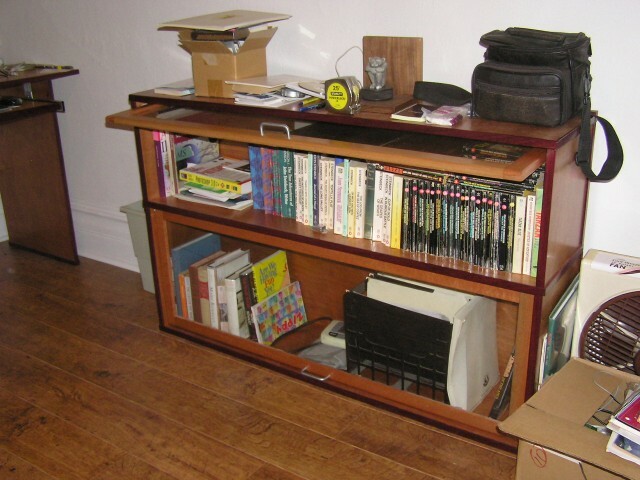 I built us each a pair of barrister bookcases ... mahogany ply with purpleheart trim, 1/8" tempered glass doors, magnetic catches. The cases can be disassembled; there is a raised rim along the back of the top to prevent objects from falling behind. 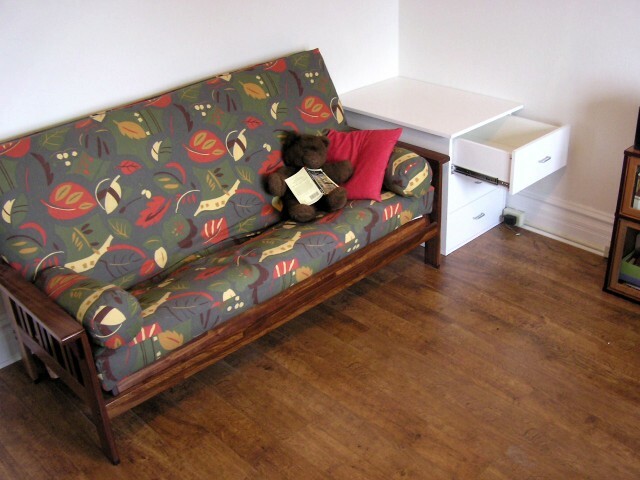 The futon is the one I made earlier. 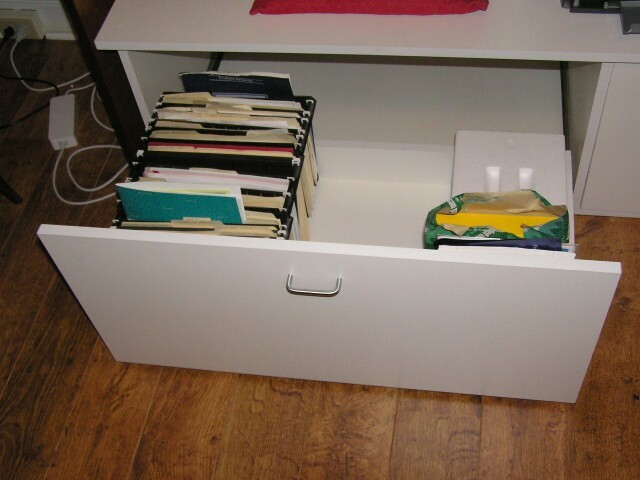 I added a three-drawer melamine cabinet to the right of the futon to hold a reading lamp. 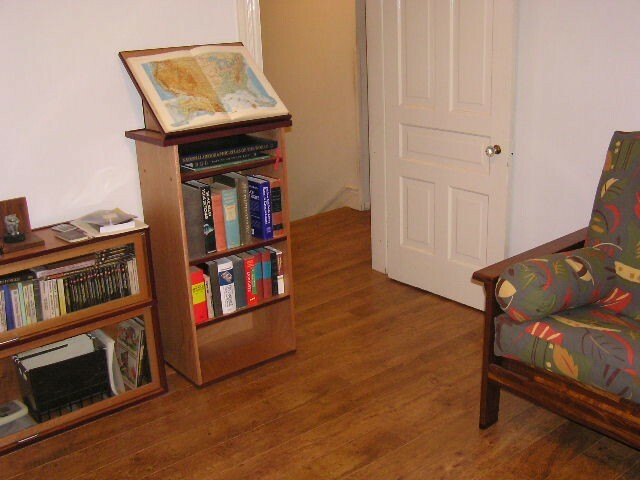 Last piece added (Nov 9) is the reference book stand for atlases, dictionaries, etc. There will also be a carpet under the central table. We also plan to paint the chairs at the desks purple and put a matching pair at the table.